It’s that time of year again: the temperatures dropping, the leaves are changing colors, and everywhere you go there’s something pumpkin flavored. It’s fall, and for most people it’s their favorite time of the year (I am most definitely an avid fall lover). With the semester flying by so quickly, everyone around campus seems to be in a panic over the same issue-no, not midterms- Halloween costumes! Every year I never know what to be for Halloween. I always dread buying a costume because: 1) they’re expensive and 2) every costume idea is justso unoriginal by now. This year, I decided to ask around and research what are some interesting, unique, creative costume ideas that’ll get people talking- or even wondering what the heck you’re wearing! 1. “Cereal” Killer: You may think dressing up as a serial killer is creepy, but this funny idea turns a whole new spin on the meaning. To create this look, wear clothing that is torn and cut. Carry a bloody knife or tape one on to your clothes, while also splattering blood all over. Finally, attach labels from cereal boxes to your clothes using safety pins. This costume will definitely draw attention! 2. Gold Digger- Turn this nickname into a word game by dressing up in all gold- have fun with it! Feel free to wear a gold dress, shoes, jewelry, and makeup to complete the look. Carry around a small shovel and voilà! You’re officially dressing the part while looking and feeling good in your decked out gold outfit. 3. Tourist- If you want to give people a good laugh, this is definitely the right costume for you! It’s creative, funny, and cute at the same time! Dress up in khakis, a floppy hat, and a flowered shirt (I’m just picturing the ultimate tourist in my head right now). Wear a camera around your neck and snap pictures here and there; also, if you’re feeling bold, wear a fanny pack! It’ll complete the look. 4. Movie Theatre Floor – Everyone always struggles to come up with an idea for Halloween- trust me when I say you will most likely see no one else wearing this! To create this costume, hot glue or safety pin pieces of popcorn to an all black outfit. Also, feel free to glue candy wrappers, soda cups, straws, movie tickets, or any other kind of trash! To make the outfit even funnier, make a shoe print using paint on your shirt. 5. Spelling Bee- Now, I know what you’re thinking: You always see people dressed up as bees and don’t want to go there. Give it a chance! This idea takes a bee costume and turns it into something more exciting. First, find a bee costume you like. Attach felt or Velcro letters to your costume. People will most likely be intrigued with your costume and can even spell out fun words on you! 6. Red Riding in the Hood- Nobody really wants to dress up as red riding hood for Halloween. Instead, you can put your own spin on it! To make this costume, buy [or if you’re good with a sewing machine] make a red cape with a hood. You can put tattoos and piercings all over you, or even wear some spiked jewelry. Don’t feel like you can’t pull this look off even if you’re too girly! The outfit will give you the confidence to act tough all night- thus fully completing the look. 8. 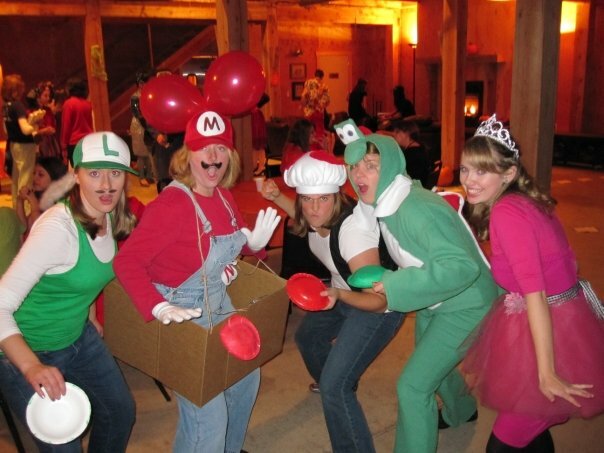 Grab some friends and dress up as the Mario Kart characters- There’s so many characters that everyone can go as a different one. Each person can dress up as their own character; next, make a racecar from cardboard and attach three balloons to the back of the car. To make this even more interesting, turn it into a game! Whoever has all their balloons in tact by the end of the night wins. Whether or not you choose to dress differently from the rest this Halloween, have fun and be safe! Katie handles the day-to-day management, development and expansion of our chapter network to ensure that our on-campus presence is stronger than ever. She recently graduated from the University of Pittsburgh, where she studied Nonfiction Writing and Communication. Her extensive Her Campus background dates back to 2012 and she has since held the position of Campus Correspondent and Chapter Advisor. When Katie isn’t watching the Pittsburgh Penguins, you can find her trying new restaurants, obsessing over her long list of shows (The O.C., Scandal and Gilmore Girls are top picks) or setting out to find the perfect donut.